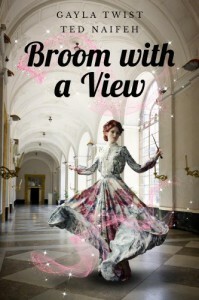 PJV Quickie: BROOM WITH A VIEW by Gayla Twist was a charming and cute young adult romance that had me engrossed until the very end. A well done piece, Twist’s novel had nothing that even hinted at “self-published” and the only thing that was disappointing was that it was too short. Review: In BROOM WITH A VIEW, Gayla Twist introduces us to an alternative historical past, in which Vampires, Witches and Humans live together very tumultuously. The main character is Miss Violet Popplewell and she is a witch. When violence rocks her witchy world and vampires are considered the culprits, her mother sends her away with her great-aunt Vera. They travel to the city-state of X, a beacon of the paranormal world, where vampires and witches seem to coexist and magic is openly used. On arriving in X, Violet and Vera discover that X is much different then what they are used to and there are actually vampires staying at their boarding house. Alarming for Vera, but Violet, whom has never encountered vampires is intrigued, especially with the son, who seems sad, in a very attractive way. Violence follows them to X though and Vera, Violet and the rest of the boarding house guest are sent this way and that as they try to avoid the rioting…but it only serves to push Violet closer to her dashing vampire Sebastian. Which causes all kind of trouble in the vampire and witch world. A paranormal romance and mystery all wrapped into one, Violet is one of those unsuspecting heroines that is thrust into plots that are much bigger then expected. The whole book had a quirky feel that is common with light historical paranormals. Twist pulled off the tone well and it held strong through the whole novel. She lightly introduced all aspects of this new world with a blasé spirit that made you feel part of the world almost instantly. This cemented the story telling instead of the more common forced telling in other novels of it’s like. The characters were also well done, each had their own unique style and behaviors. All the supporting characters brought more depth to the novel and there was nothing two-dimensional about them, even the smaller roles. The only character that I didn’t feel was as flushed out as it could have been, was Sebastian, which led me to not feel the romance aspect of the story as much as I wanted. Sebastian was a nice character, but I wasn’t swooning over him, which is always an added benefit in these YA Paranormal reads. I do believe the fault in the romance was because of the short length of the novel, at only a little more then 200 pages, there was a great BIG story shoved into a tiny 200 page package. A bit more length and I might have fallen head-over-heels for Sebastian also. Even though this was a down-point, Twist’s world-building out-shined everything else and I was entranced with the City of X and the past where vampires and witches war with each other and humans are along for the ride. Recommendations: If you are a fan of YA Paranormal, or YA Historicals this is the book for you. I’m putting this at a PG-13 Rating, mainly because there is some violence and talk of war.